At Drives & Controls 2010,Harting will present the first UK demonstration of Fast Track Switching, a new switching technology that allows manufacturing organisations to integrate their office and automation networks into a single Ethernet-based communications platform: the Automation IT concept. 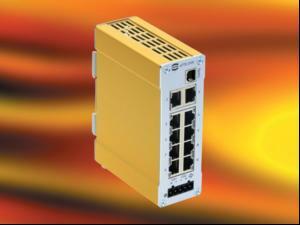 Using Fast Track Switching, a user can port an Ethernet-based system into the automation world with the full use of all the degrees of freedom that standard Ethernet has to offer. This includes the integration of components and subsystems from outside the traditional automation environment - eg. vision or RFID - which may not support automationspecific protocols but generally have At Drives & Controls 2010,Harting will present the first UK demonstration of Fast Track Switching, a new switching technology that allows manufacturing organisations to integrate their office and automation networks into a single Ethernet-based communications platform: the Automation IT concept.